Got an idea for a tour? 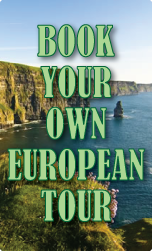 We can create a tour for your group to anywhere you want to go. You choose the food, the departure time, destination, etc. Need information for New York City? Where to take a group for dinner, or get tickets to shows or special events? We can plan it all for you. And we'll stay behind the scenes so your group will think you planned everything!